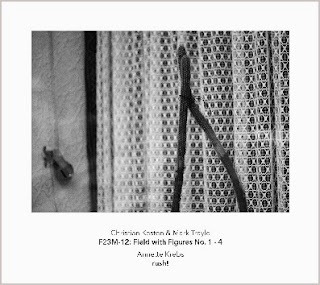 The second release in Another Timbre's split-disc Berlin series, two very challenging works. I'm only minimally familiar with the work of both Kesten (voice) and Trayle (electronics, guitar) and had little in the way of expectations. The piece, in four parts, is very jagged in some respects, especially the earlier electronic portions, the sounds arrayed in unusually "awkward" sequences--I should rather say unanticipated as, over its course, a kind of implied pace, if not rhythm, makes itself felt. Kesten's contributions are extremely subtle; generally, the only way to distinguish them (not that it's necessary) is to infer by exclusion and assume what remains must be him--the sustained breathing sounds. Often, those sounds act as a kind of tinge on Trayle's more aggressive noise but then they'll suddenly sync up, attain equal "weight". When they do, it's a very beautiful, if icily alien effect. The work trends toward slightly quieter climes, the second part engaging in some sound-play that's a bit goofier than I'd have wanted to hear, though the latter two sections settle down into some fine areas, still prickly--sharp pings and harsh breath, for instance, morphing into rough-edged siren-like sounds--but interspersed with softer, if slightly sour moments, really fine. My own perceptions shifted substantially from listen to listen, always picking up different relationships, different senses of structure--this is a good thing! A tough, bracing piece, I like it. Krebs, on the other hand, I've been following pretty throughly over the years and my impression at the moment is that "rush!" (two versions presented here) is her most solidly realized work yet. The elements will be more or less familiar to listeners who know her work: isolated words (or fragments thereof), urban field recordings, guitar-sourced sounds. In earlier works, there was often an intriguing and, for me, beguiling awkwardness in structure, sometimes not entirely working, other times seeming to work despite itself. Here, she's just barely smoothed the edges and, while retaining a very personal feeling of pace and progression, imparting a real, flowing solidity to the music. Her choices are dreamlike, sometimes disturbingly so. The second version includes several of the same elements but also makes use of protracted silences that somehow increase the dreamy aspect, the voices, radio grabs and other sounds appearing suddenly--and briefly--out of the dark. The scattered instances of what I take to be a deep, bowed guitar lend a beautiful, mournful cast. Really strong work, perhaps my favorite thing thus far from Krebs.